Fresno wasn’t our destination, we just found ourselves there, like so many others who came to visit relatives, attend their kids baseball or soccor tournemant or, for diehard baseball enthusiasts, who came to see the Bulldogs, their AAA ball club. I was so enthusisatic about our visit, I tried to write a piece about Fresno as a place that you ought to go, a destination. But I just couldn’t do it. The New York Times tried with a 2006 36 Hours in Fresno piece in which they listed the usual Fresno highlights, but they couldn’t do it either. The following July we ran into a couple from Fresno in Monterey, on a cool beach. We told them how much we had enjoyed it there. They asked, “When were you there?” When we answered March, they smiled and told us that it was 107 degrees there yesterday. In March of 2106, my wife Susan performed her one-woman-show at the Rogue Fringe Festival. I’m not sure you can get much further “Off Broadway” than that. A Fringe Festival is a performance event utilizing multiple venues. 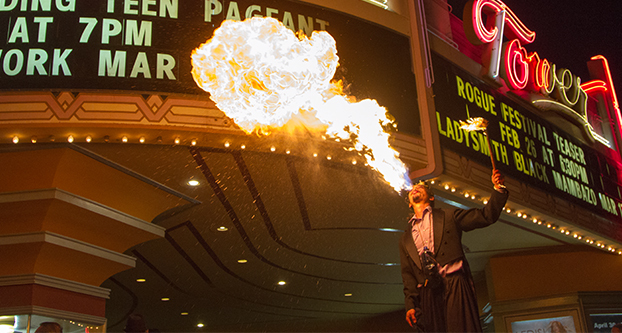 There’s no limit to the kind of acts; solo performance, stand-up, music, dance and even magic. There’s no audition. 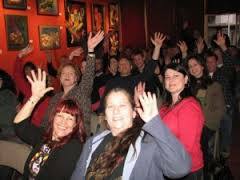 Performers are generally chosen on a first come first served basis; they pay a venue fee and then get some or all of the box office. Performers can’t really make much money at festivals like this. It’s about the chance to try out new material, gain experience and exposure and have a good time. The Rogue isn’t a new event. This is their 15th season and lay claim to being the biggest Fringe Festival west of the Mississippi. Over 65 performers give over 200 performances in eight venues over a ten-day period in early March each year. Tickets are $5 or $10. Susan’s show Is your Therapist near a Bakery? (reviewed below), was presented at a community arts center with 50 seats next to an Italian restaurant. We found a lively network of local artists and performers and everybody seems knows everybody else. While many of the performers were locals, the Festival attracts people worldwide, but many of them knew each other from the fringe circuit. During the event, festival staff, performers and audiences wander the streets going from show to show, enjoying a meal or a drink. The performers are out in force between shows passing out cards, talking about their show. We all become a pretty tight crew. One of the best events of the Festival is Teaser show on the first night. In the 750-seat Tower Theater, each performer puts on a two-minute teaser about their show. This is a great introduction for the whole festival and audiences mark up their calendars for the not-to-miss shows. Then, afterward, many assemble at the bar. We arrived in Fresno not knowing quite what to expect. 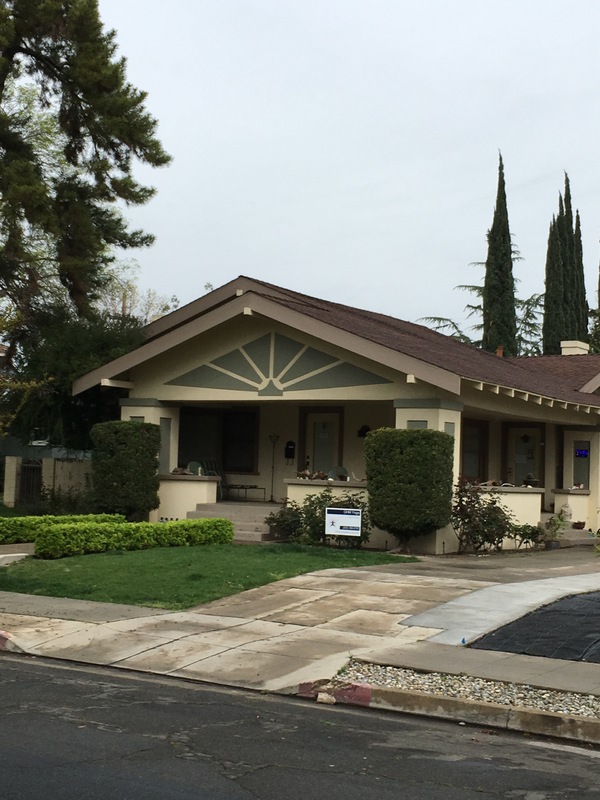 We rented a great little 30’s bungalow on Airbnb close to the festival, in a quiet residential neighborhood a few blocks from Fresno City College. The place was filled with lovely and unusual art piece; Yoga classes were sometimes held in the dining room. 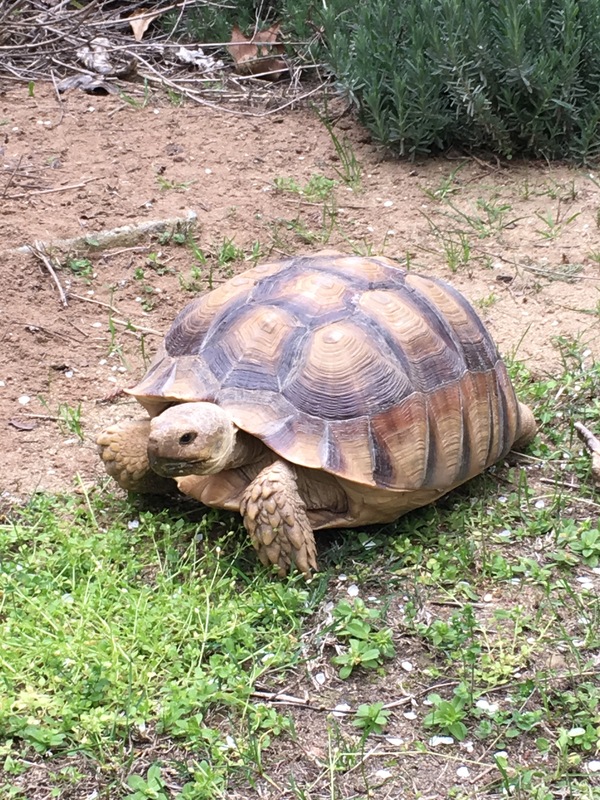 The place was immaculate, plus the very special benefit of a rather large tortoise living in the back yard. You never get that in a Best Western. After we settled into the house, we took off looking for the venue for Susan’s show. Siri led us astray for some time before we finally figured it out, feeling like a teenage rock band booked into our first gig at an out of town bar. The difference was that we weren’t stoned. The Rogue is centered in the Tower District. This is an eight block commercial neighborhood about two miles north of downtown Fresno, anchored by the Tower Theater which is experiencing a renaissance of new restaurants and performance venues. 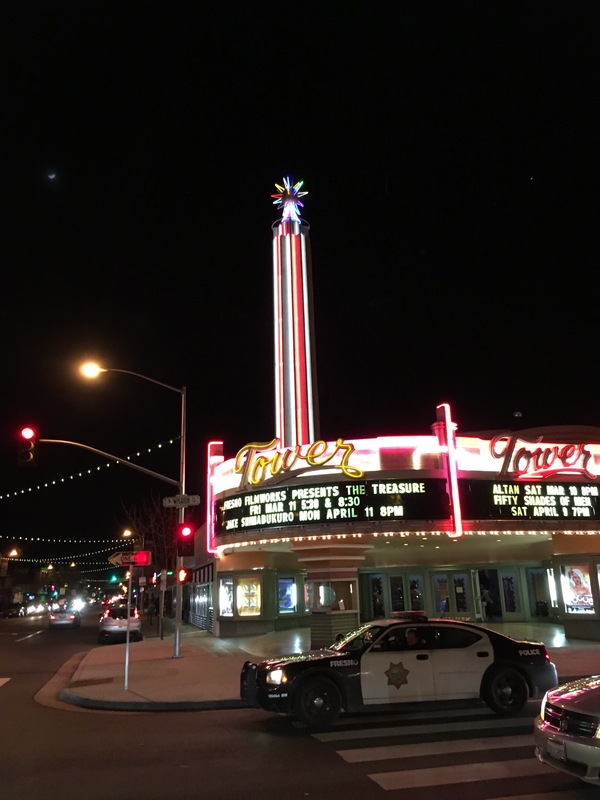 Tower Theater – This is a real community asset, hosting a wide range of events that serve the overlapping social groups that is Fresno. For instance, in addition to the Rogue, the week we were there they had the Miss Fresno beauty pageant and the Chippendales, 50 shades of Men. Aside from the theater there is quite an array of good places to eat, almost all within walking distance. Chicken Pie Shop – Even from the outside we knew we were entering a time warp back to 1950. 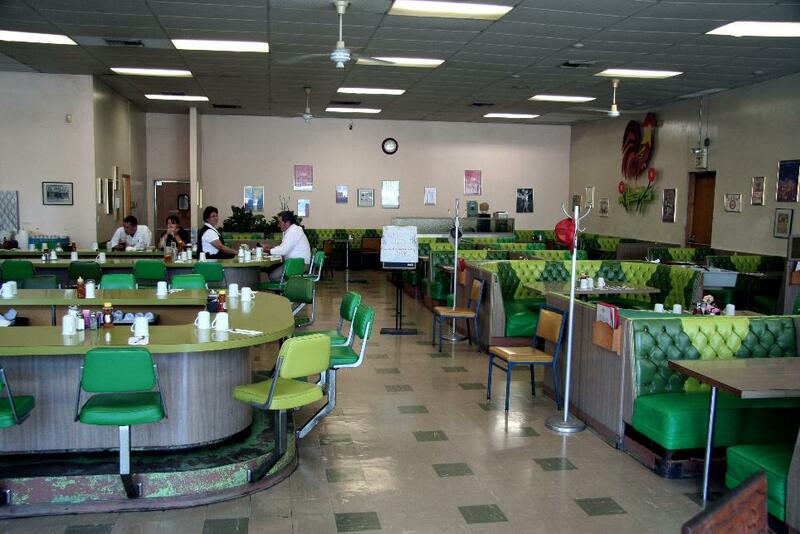 It’s a big space with aqua and yellow leatherette booths, pink formic tables and a big curving counter. I’m not really sure what else is on the menu, but they have homemade chicken pot pies. You can eat them there or get them half baked and heat them off at home. I’m sure they are not at all acceptable in a foodie artisanal farm to table organic way, but they are delicious and unhealthy comfort food that we completely enjoyed. 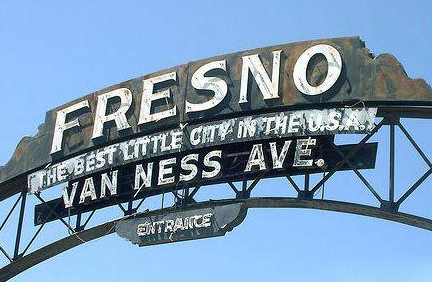 To accept Fresno without attitude, it’s best to leave the Bay Area behind. Irene’s Cafe – Good local place for breakfast and lunch with outdoor seating; our go-to breakfast place. 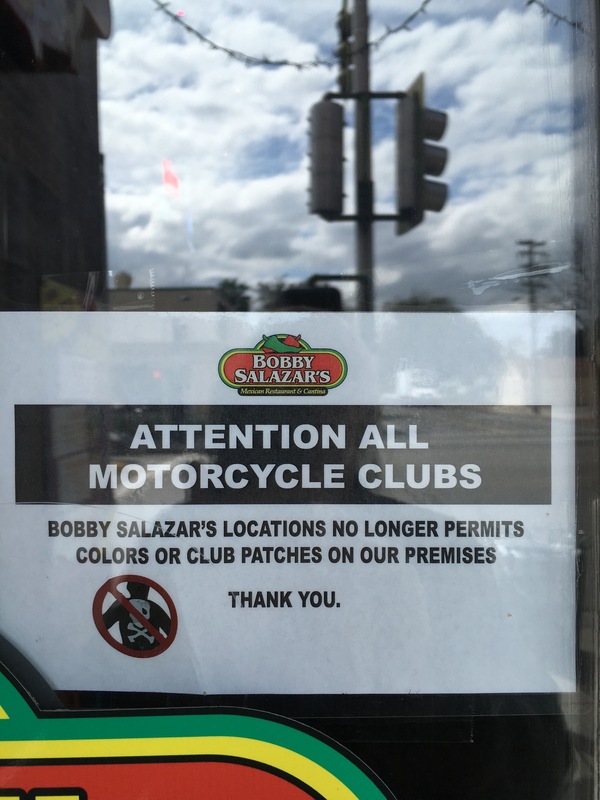 Bobby Salazar’s Taqueria – This is a sports bar with a food truck inspired taqueria in the back. It was busy on weekend nights and had this sign on the door. Mia Cuppa – This is the social center of the festival. A local coffee shop to rival any Bay Area shop with the added attraction of a performance venue in the back. Vini Vidi Vici – This is a mid-range Italian restaurant with a large covered outdoor patio which was also a venue for the Rogue. 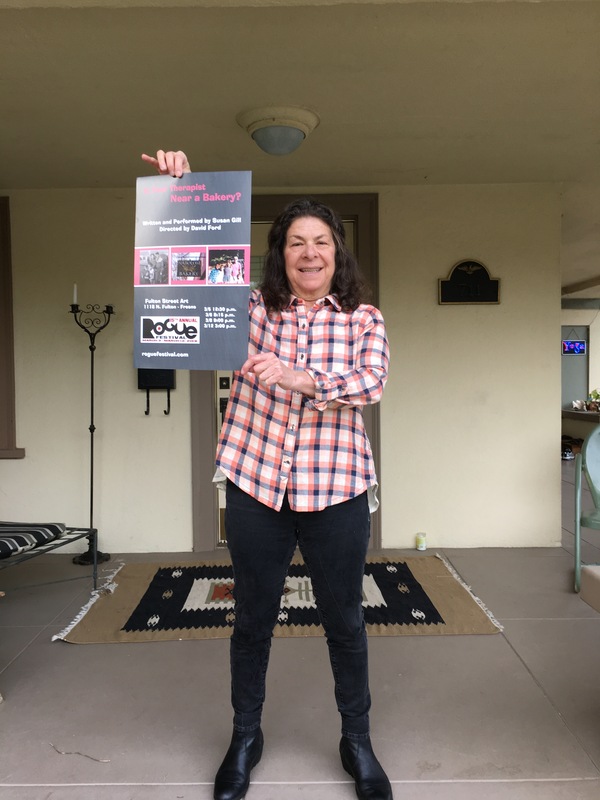 Strummers – After her show Sunday night, the street was quiet but down a side street, and we saw a crowd in front of what looked like a club, Strummers. Most nights they have music but that night they had wrestling, a full size ring and all. Annex Kitchen – This is “Fresno” hip. It’s located on a shopping center several miles to the north, on the edge of a more middle-class neighborhood. It has a good varied menu, wine list and young hip crowd. Al’s Café – On the economy side, I give high marks to Al’s Café, even though it isn’t strictly in the Tower. It’s located several miles to the west on Olive just past the Highway 99 entrance. We went there twice for breakfast on our way out of town. This is truly good Mexican food with great service, which was full at 10am on a Monday and packed with waiting on the next Sunday morning. They occupy a repurposed Wendy’s giving a preview of post corporate/apocalyptic world. Mad Max meets huevos rancheros. Fortunately she had time to collect herself, put on some makeup, hoping her hiking pants and shoes wouldn’t turn up on the screen. Chuck had a wonderful patter, warming up the studio audience. “What do you call a teacher with gas? A Tutor.” He assured us that he had done a 100-day hitch-hiking road tour in 1984 with material just like that. Chuck was wonderful with each of his guests making jokes, pitching their products and all the while having a great time. The Buzz is wonderfully quirky local daytime TV, but not so small time. Chuck told us that he has over 200,000 viewers each day. Susan’s interview was so much fun. Chuck sat at a desk filled with little figures and gadgets. He really is a good interviewer, drawing out guests while giving them space to make their pitches. The guests sit in a very big low chair. 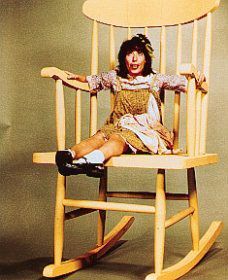 Susan, of small stature, posed a striking resemblance to Lilly Tomlin’s character Edith Ann. Here is the link to here interview. Among the several performers there were the SHEnatras, a musical act was based on the premise that Frank Sinatra and Dean Martin had died and gone to purgatory, but as women, to make up for all their bad behavior in life. Aside from Rogue performers, Chuck had several sponsors. Jan Benson, a Reiki practitioner, whom he enlisted to help him recover from his late night the night before. “That’s just the toxins coming out,” she said after he moaned with each hard adjustment. And finally two managers from IHOP who set up a cooking demonstration in the studio in celebration of National Pancake Day during which they blew out the power in the whole station, fortunately this wasn’t live TV. They told us IHOP gave away amounted to a stack of pancakes 19-miles high. 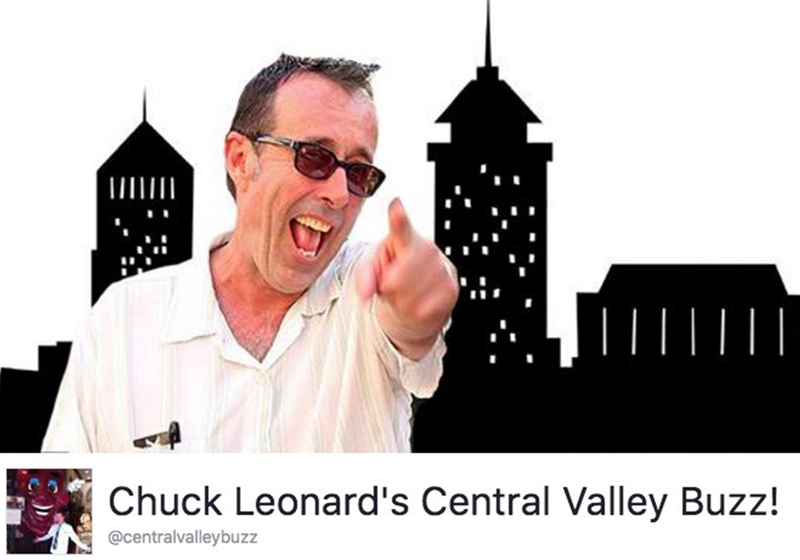 Scroll down through Chuck’s Facebook site. There may be no better way to get a flavor of Fresno. 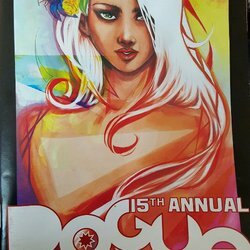 After 10-days, the Rogue was over. Saturday night, after the last shows, there was a wrap party at a local club. We were tired and Susan was coming down with the flu, but we went anyway. We took possession of a couch, ordered a couple of glasses of wine and enjoyed the passing parade. Only a few of the out-of-towners showed up. This was a mostly locals event. The director came by a couple of times to check in with us, happy that we had made the effort. We may not have been the oldest people there but the median was certainly 30 years younger than we are. There was a good band, lots of dancing, recognition for all the shows that sold out and a rollicking good time. We left early, happy to have been included. One reason I love the Rogue Festival is because you see shows here you would never see anywhere else–people tackle difficult subjects in fun, interesting, and informative ways. That is exactly what happens in Is Your Therapist Near A Bakery? Is Your Therapist Near A Bakery? 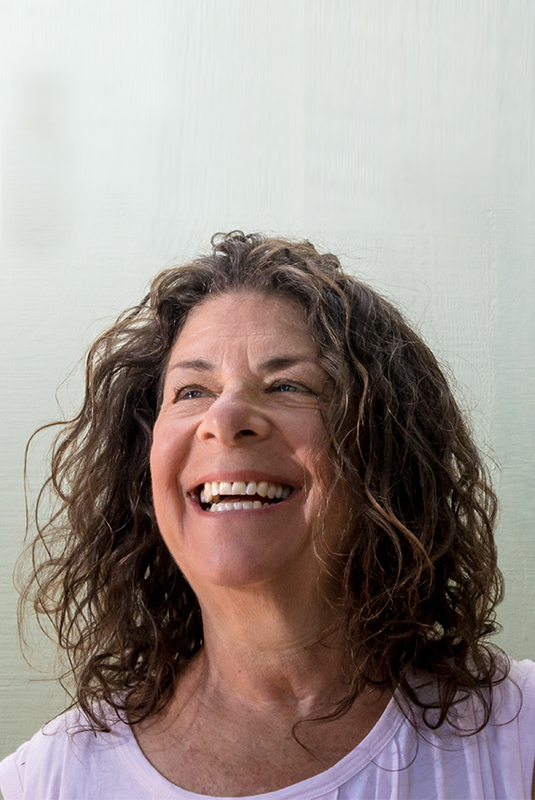 is Susan Gill’s one-woman show where she shares about her family’s history of mental illness. She is bold, funny, and honest. She shares of a time when you kept those sorts of things hidden–where the stigma was even worse than it is today. Some of her stories are just plain funny as she shares about how she was the “normal” one in her family, and how she has strived to have a mentally stable family of her own–you will laugh when you hear what happened when her ten-year-old son informed her he wanted to go to therapy. And of course, what’s better than your therapist being near a bakery? But she also shares about her experiences with those in her family who were mentally ill and how it affected her, and her need for therapy as well. There are sad and disturbing stories here of attempted suicide and sexual abuse, and yet she presents them in such a way as to not be awkward. 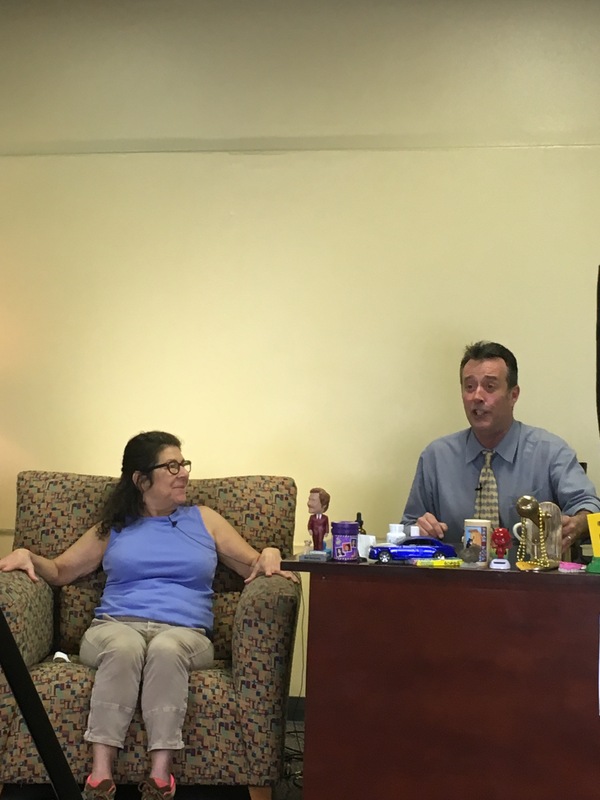 She makes you laugh and maybe even cry with her as she shares her journey with mental illness in her family. I’ve always felt the best way to do away with mental illness stigma is just to be honest and share, and that’s what she has done here in a wonderful and entertaining, while thoughtful, way. This is not a family show, but it is an honest one you won’t want to miss!